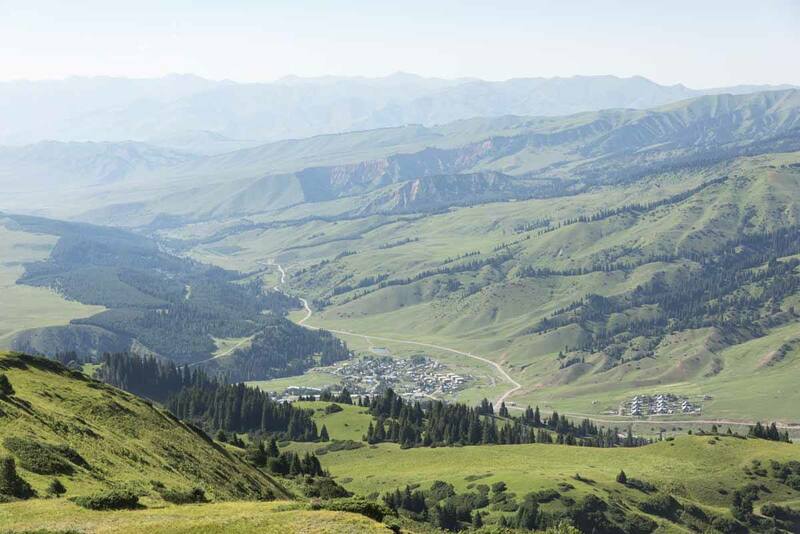 Welcome to our third Kyrgyzstan post… but fear not, lots more are coming! 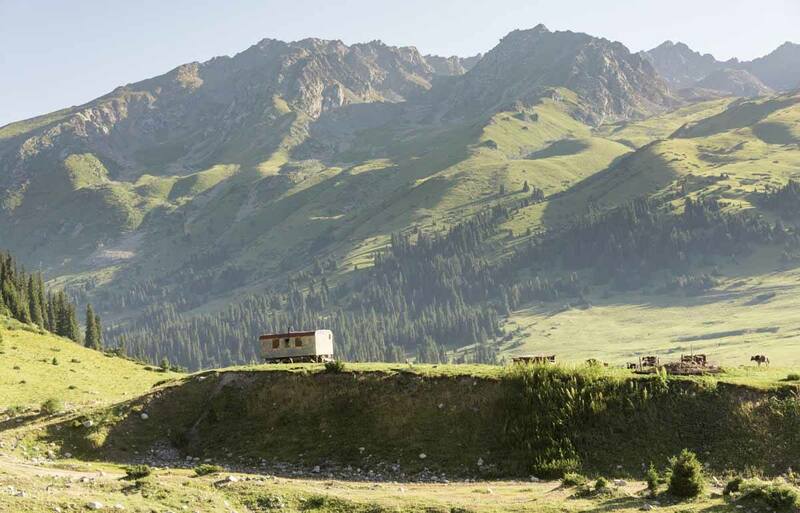 In this post we’ll take you to visit Jyrgalan, a stunning mountain village and one of the best places to start your Kyrgyzstan hike and enjoy Kyrgyz hospitality. 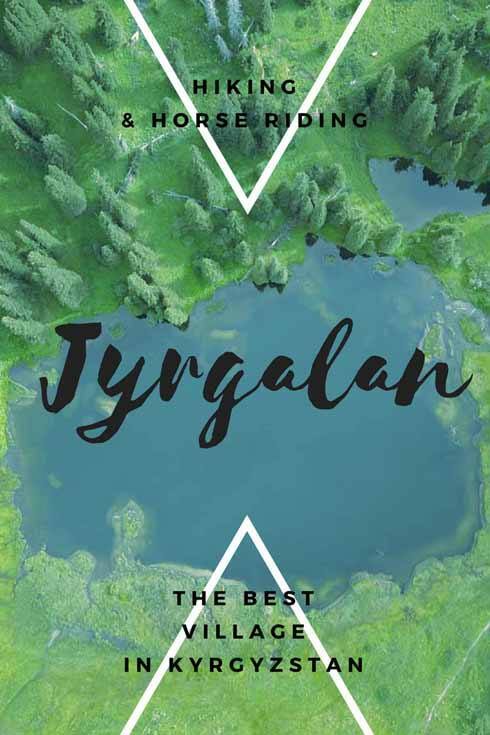 We’ve come up with 8 reasons to visit Jyrgalan – but I’m sure there are many more! The creak of a gate awoke me from my drifting, dreamless sleep. I was still exhausted, after having hiked the Turgen-Ak Suu trail and having enjoyed a gigantic Dungan dinner in a village near Karakol over the previous four days. I opened my eyes to a new scenery. We had left Karakol earlier that morning, a city that was pleasant enough, but a city nonetheless – with the usual post-Soviet combo of concrete, wide boulevards, rusted Lada and trolleybuses. Crossing the gate into Jyrgalan felt like crossing into another time, into a new dimension – one in which nature still rules the rhythms of the day, and the boundaries between village and wilderness are somewhat blurred. A row of tin-roofed, one-story houses lined the main street of the village. All houses had a small garden out front – sometimes there were sheep or goats roaming, other times we saw cows, chickens or even horses. 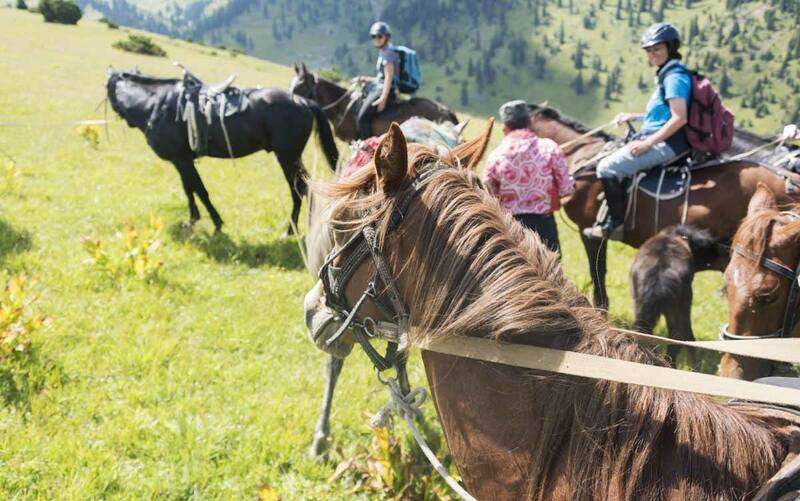 In rural Kyrgyzstan, riding horses is part of everyday life – herdsmen ride horses when leading their animals to the jailoo, the high pastures. Children ride horses when going off to play – that first morning in Jyrgalan, I saw three young kids riding a small palomino, the smallest of the three holding tight onto the horse’s mane as it trotted off towards the Jyrgalan river. 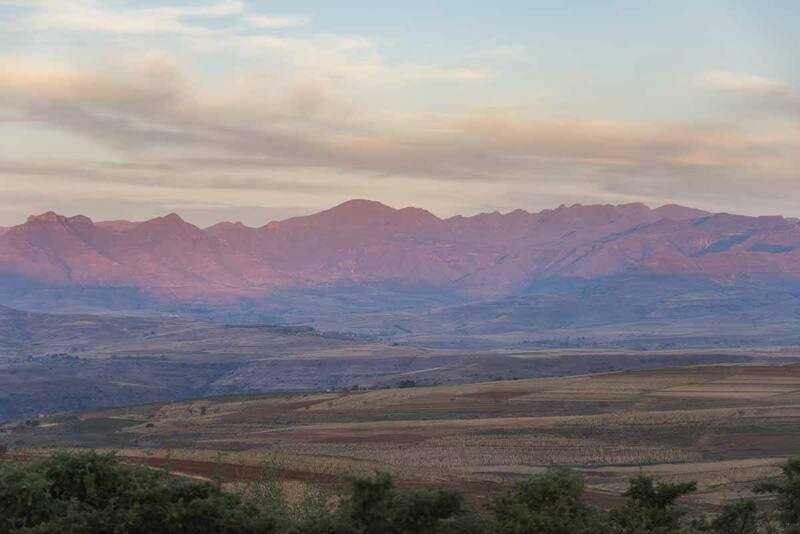 I looked up and saw mountains, surrounding the village in all directions. The peaks closest to the village looked soft and rounded, probably covered in wildflowers and the soft grass of the jailoo – while further away, in the distance, I could rocky, jagged mountains, streaked with snow and glaciers. I made a quick mental calculation – Jyrgalan village is at 2500 meters above sea level, so those peaks in the distance must be at least four or five thousand meters above sea level. Jyrgalan is not only a gateway to another time, to a place where life flows slowly, but also to a world of extreme nature and adventures – to a world of rocks, glaciers and high mountains, where snow leopards still roam, and many peaks are yet unconquered. After three days, we left Jyrgalan with our eyes full of beauty, and our hearts filled with joy for the many wonderful memories we shared with Jyrgalan locals and fellow travellers, in the short time we spent in this very special corner of Kyrgyzstan. Visiting Jyrgalan was the highlight of our time in Kyrgyzstan, and the place that best encompasses Kyrgyzstan and what it has to offer. There are countless reasons to visit Jyrgalan – and naturally, adventure is at the top of the list. 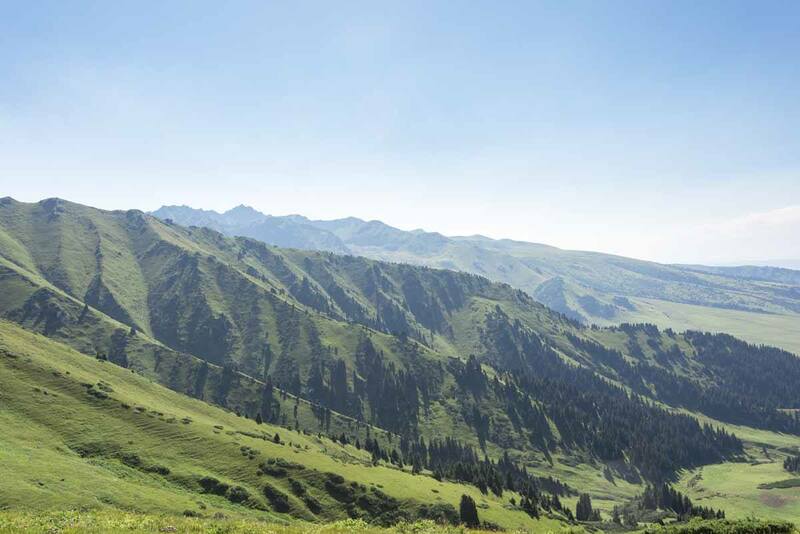 The scenery around Jyrgalan is out of this world, and you don’t need to head off on extreme multi-day hikes to be surrounded by nature – even a half-day outing is enough to appreciate the beauty of the Tien Shan mountains. Here’s a quick roundup of our favourite pictures from the village and surrounds, as well as 8 reasons to visit Jyrgalan, a place where we left of our adventurers’ hearts. 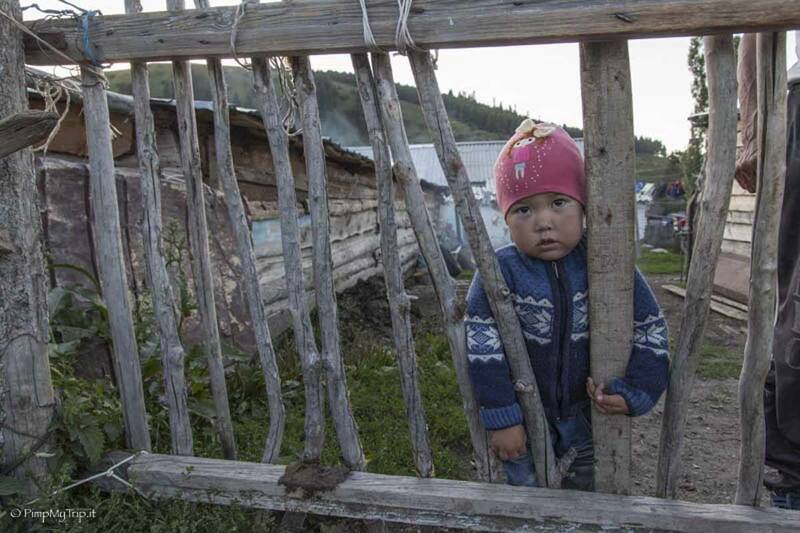 Jyrgalan is one of the pilot projects of the USAID BGI project in Kyrgyzstan. 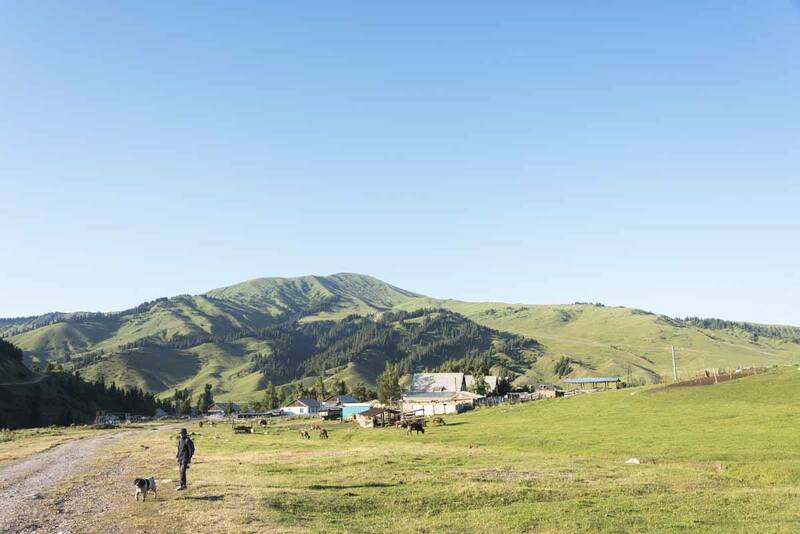 The project aims to introduce community-based tourism to this corner of Kyrgyzstan – that means having locals manage and directly profit from tourism, rather than having them employed as cheap labour force. 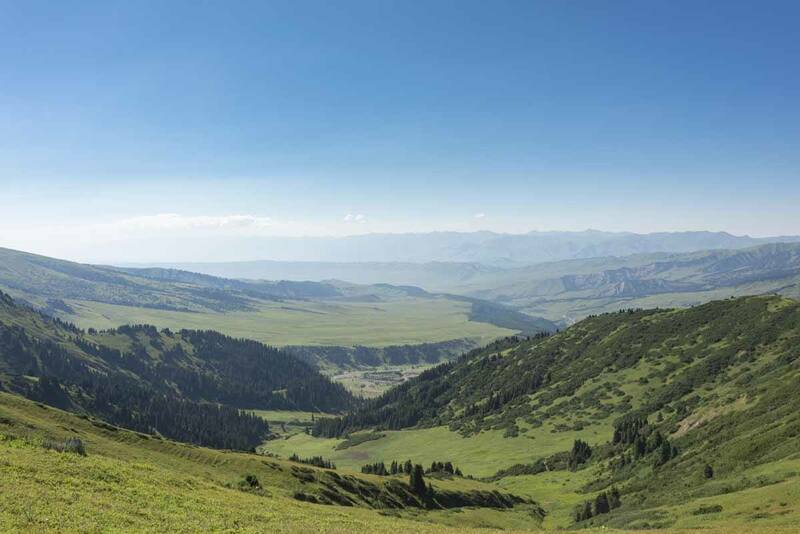 Kyrgyzstan is still wild and unspoiled, and we heard concerns of the county being ‘ruined’ by mass tourism in the not to distant future. In a world where the divide between tourists and locals is getting deeper every season, USAID is working in Jyrgalan to prevent that from happening. Instead of building large hotels and bringing big-name adventure tour operators in, village houses have been turned into homestays and guesthouses, and more and more locals are becoming mountain guides every year. The ‘unofficial’ centre of tourism in Jyrgalan is Alakol Guesthouse, run by friendly Emil and Gulmira, the first and largest guesthouse in the village, where hikes and activities can be arranged. During the course of the last year, four more homestays/guesthouses were opened – we stayed at Rahat Guesthouse, right across the road from Emil and Gulmira’s, run by a lovely lady called Janyl and her daughter Saikal, who speaks a little English. 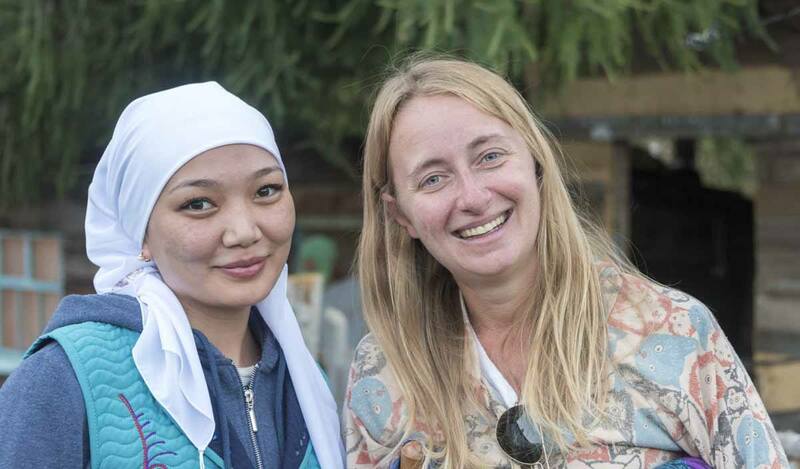 Visiting Jyrgalan, you’ll be welcomed into your hosts’ homes and experience Kyrgyz life for a few days, and you can rest assured that your host family will benefit directly from your stay. There are no restaurants in Jyrgalan, and no grocery shops – you’ll be able to enjoy your meals family-style in the guesthouse you’re staying at. Rahat Guesthouse only has two rooms, and when we stayed we were the only guests. Every day, we enjoyed dinner and breakfast in the main room of the house – one day we had a tasty dish of beef and hot peppers on a bed or rice, and the second day the family decided to honour us by cooking a Kyrgyz-Italian hybrid spaghetti dish, a lot nicer than it sounds! Emil and Gulmira usually host larger groups, and dinner is served for everyone on communal tables – one night it might be manti or plov, the ubiquitous rice and meat dish found everywhere in Central Asia, another night lagman, noodles made by hand by Gulmira and her mother and then stir-fried with beef and fresh veggies. More often than not, vodka and brandy flow abundant during (and before, and after…) dinner, as fellow travellers toast newcomers and farewell new friends off to new adventures. 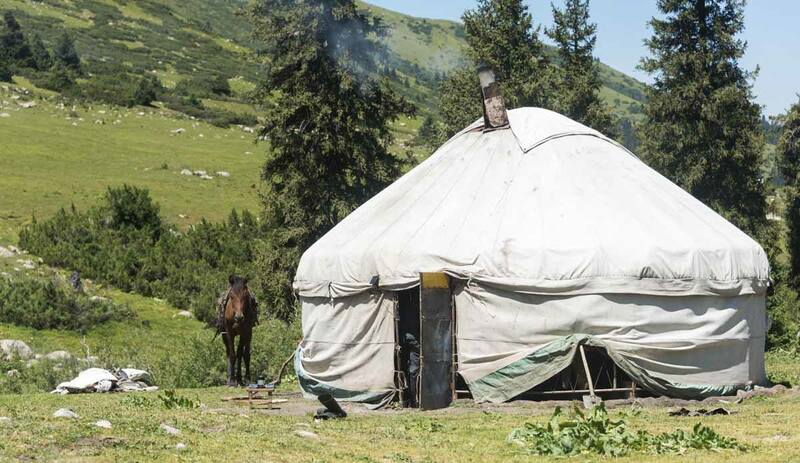 Staying in a yurt (known as ‘Boz Ui’ in Kyrgyz) is one of those experiences you simply cannot miss while in Kyrgyzstan – there are several yurt camps near the southern shore of Issyk-Kul lake and near Son-Kol, or in the mountains, but if you’re not making it that far, you can stay in a yurt at Emil and Gulmira’s guesthouse! Yurts are very spacious inside and typically you would share the yurt with other travellers in your group – 4-6 people will fit comfortably in Emil and Gulmira’s one. Jyrgalan is the starting point of many multi-day hikes, and every day there are expeditions coming and going. The Jyrgalan and Keskenkija trek are two of the many options, and for something a little more extreme you can opt to head to Engilchek Glacier, where you’ll find a base camp. If you can only spare one day, we recommend the full-day hike to Kyle Pass and Emil’s Peak. Yes, we are talking about the same Emil that runs the guesthouse, while Kyle is a USAID team member who spent a lot of time in Jyrgalan developing the project. This part of Kyrgyzstan is still so wild, that many passes and peaks are yet unnamed – maybe you’ll be able to name something after yourself. The Emil’s Peak hike starts west from the village. 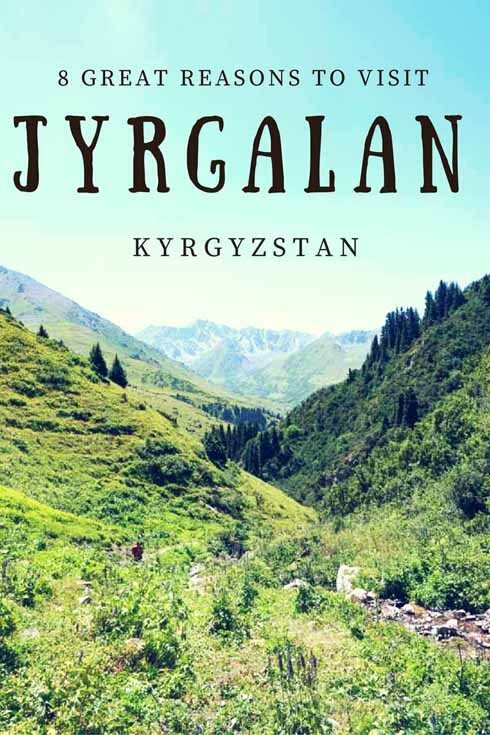 Follow the Jyrgalan river out the village and then take the path heading up to Eki Chat, a small yurt settlement where you can stop and enjoy a rest, and even visit one of the local families who will no doubt offer you some kymyz (fermented horse milk). The trail until Eki Chat is also doable on horseback, but after that the path gets too steep and overgrown and it’s necessary to continue on foot. From there, it takes a further hour to get to Kyle’s Pass, covered in orange wildflowers on one side and white ones on the other, and another 40 minutes to Emil’s Peak, offering great views over the mountains. Another fun day trip from Jyrgalan is riding to Turnali Waterfall. Emil and Gulmira also arrange guided horse rides, and provide riding equipment like gaiters, gloves and helmets. The path to the waterfall starts on the eastern side of village, after the cemetery where Soviet stars and Muslim crescent moons stand side by side on the graves, which also happens to be one of the best sunset spots in Jyrgalan. The trail climbs gently for about two hours, making the ride perfect for beginners. When the trail gets too rocky for the horses to keep going, you’ll need to get off and continue on foot. After 10 minutes you’ll reach a small secluded waterfall cascading through the rocks into a stream – a great spot for your lunch break! …and a not so easy one to Turnali Lake! After visiting the waterfall you can either ride back to Jyrgalan, or head to Turnali Lake, a small mountain lake that you’ll reach after a hair-rising two hour ride across the mountains. From the waterfall, follow the trail back to Jyrgalan until you’ll notice the road forks – keep going left to head to the village, or turn right to follow a trail cutting heading up to the mountains. Forget the lazy, undulating inclines of the trail to the waterfall – the way to Turnali Lake is steep, rocky, muddy and slippery, and a real hair-rising challenge if you’re not used to horse riding. 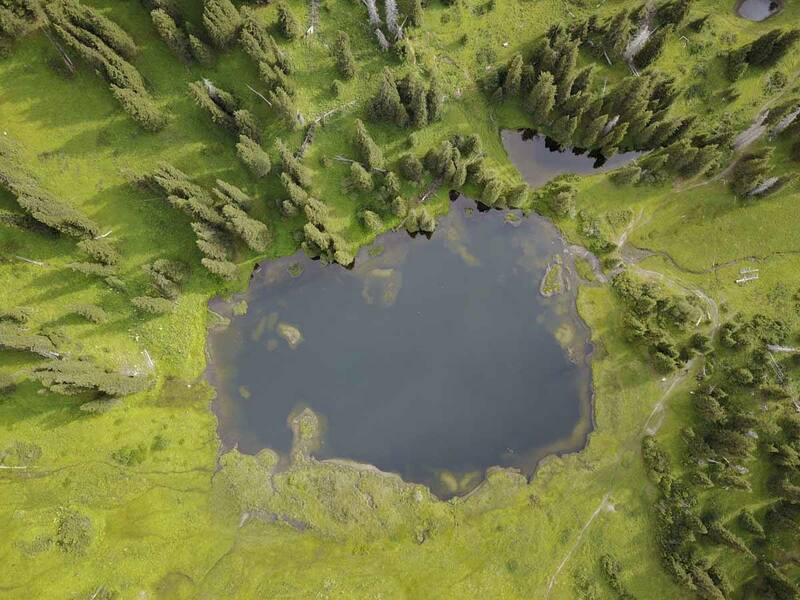 Luckily, the reward is a true gem – tiny Turnali lake, surrounded by meadows and pine trees, making for a perfect short stop before a further two hours ride back down to Jyrgalan. Well, this goes without saying. If you head up the mountains, whether on foot or horseback, you’ll be left wide eyed in amazement. Even if you just take a short walk out of the village and look up, your jaw will drop. Actually, you don’t even need to walk out of the village – just look around, and be prepared to fall in love. Just like we did. Can you see tiny little Jyrgalan below? Hiking and horse riding are two of the main things to do in Jyrgalan, but even if you can’t (or don’t want to) do either, Jyrgalan is still worth a visit. Locals are kind and welcoming – just walk around the village to see what I mean. 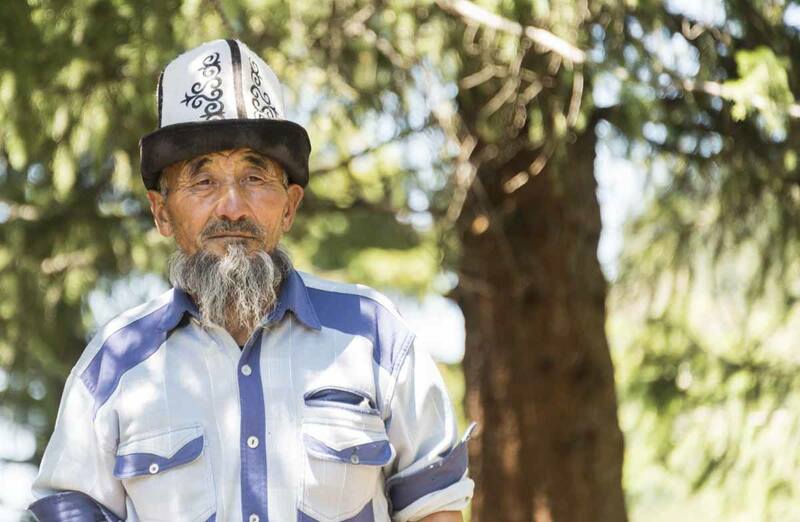 The people we met in Karakol and Bishkek were always polite, but very reserved, and not speaking Russian or Kyrgyz we never went beyond a quick hello or a shy smile. 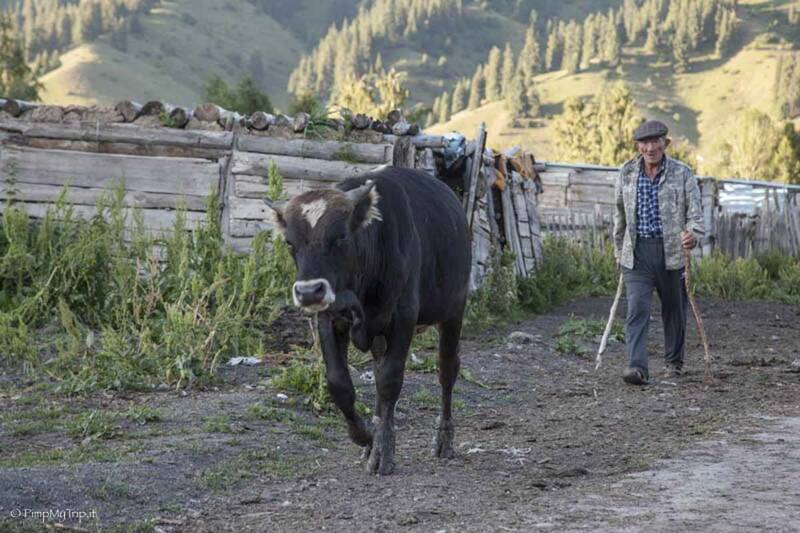 On the other hand, in Jyrgalan, villagers greeted us and smiled at us, wherever we went, welcoming into their gardens to look at their animals and into their homes for tea and sweets. Jyrgalan has something. 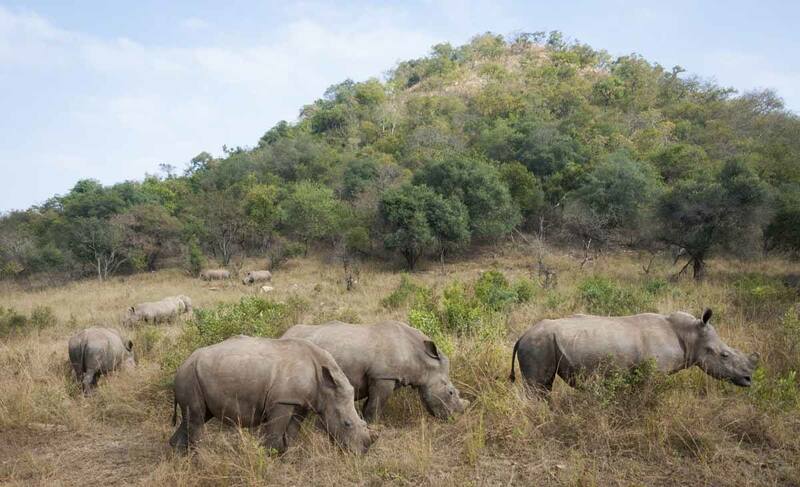 That little something that brings locals and travellers together, united by the love for nature and adventure. A place like Jericoacoara in Brazil or Jezersko in Slovenia, where like-minded travellers realise as soon as they arrive that they’ve found a special place. This is what we felt as soon as we crossed the gate, when we arrived – and when we crossed that same gate and said goodbye to Jyrgalan, two days later, the same thought crossed our mind. That, soon, we will visit Jyrgalan again. If you want to know more about Jyrgalan, check out the official Jyrgalan DMO website! Hello! How lucky that you just wrote this article a couple months ago, and my partner and I are planning a last-minuteone day & night Excursion to Jyrgalan. We have our own transport, and we will only have time for a Day hike starting tomorrow and then one night stay before heading back to karakol. I read about the Emil Peak trail. Are there any other one day or half-day self guided hikes that you would recommend? Can you provide a trail description or advice on how to get details or a Map for the Emil Peak Trail? Sorry for the last minute inquiry, and I hope to hear from you! Thanks! Hi Megan! That is so amazing you’re heading to Jyrgalan! I don’t have a map because we went with a guide, but you can easily head to Alakol Guest House when you get to Jyrgalan (I assume that’s where you’ll probably be staying anyway) and ask Emil to show you the way or to provide you with a map. The way to Eki Chat is pretty straightforward – follow the Jyrgalan river out of the valley until you find a large trail (suitable for Ladas) climbing on the right hand side. This will take you to Eki Chat after about 6 km. From there, keep following the trail upwards, turn left into a smaller trail and go past another small yurt settlement. After passing the yurts, walk through a narrow valley, then when this opens up you’ll be able to se Kyle’s Pass on the left hand side. Cross the pass, then veer right around the mountain (it’s really steep), then follow a kind of ‘S’shape as you veer left. From there you’ll descend slightly to Emil’s Peak. Then you don’t need to turn around and go back – you can just follow the trail back to Jyrgalan. It’s about a further 3 hours back. In any case, this is just a very rough description, so your best bet will be asking Emil for more detailed directions or a map, or even a guide if you would like. They’ll be glad to help. I hope you’ll have a lovely time!